I had spent the last 3 months trying to convince myself that it was just any other race so that I didn’t get too worked up about it and waste too much nervous energy. 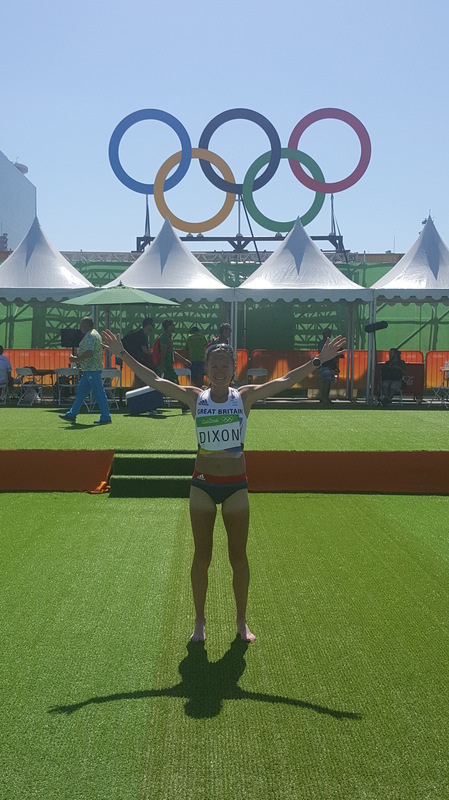 Training had gone well in the tight turn around from the Virgin Money London Marathon and I had put in 2 solid races at Blaydon and the European Half marathon championships. But this was the focus, the one which I’d dreamed of for over 25 years. The weather forecast said it was going to be pretty warm – 26 degrees at the start and rising to around 30 degrees by the time I finished. Add this to the predicted humidity levels of around 85% and it wasn’t looking towards a comfortable race! As it turned out temperatures hit a high of 34 which I can confirm is pretty hot for running a marathon!! Thanks to the support of British Athletics, British Olympic Association, London Marathon and the National Lottery, I was well prepared. I’d been up in Font Romeu for 2 months where we had had days in the high to late 20’s and then I spent 11 days in Belo Horizonte where temperatures topped 30 alongside some high humidity. I’d practiced pre race cooling using ice vests, iced wrist bands and had tried using a high sodium drink which acts as a plasma expander to help your body cope with high temperatures better. On race day, I completely forgot to take the wrist bands and sodium drink with me so it was down to the ice vest and lots of ice cubes under a cap to try and cool the body down during my brief warm up and before the race start. Once we got through the pretty chaotic call room – queues for transponders, led to queues for number change (font on originals was too small), led to queues for athletes involved in the call forwards! There was time to pour a final bottle of water over the head before running to the start-line just in time for the gun to go. This left me towards the back of the field but I was fine with that as my race plan was to go out conservatively and pick up in the final quarter with the aim of finishing strongly and passing those who had over cooked it early on. As we didn’t know how the heat was going to effect me in the latter stages I was prepared to go out as slow as 6 minute miles to make sure that I didn’t over do things early on. I started at what felt like a jog but when my watch bleeped for the first mile I was quite surprised to see 5.43 on it. I did ease back a bit and even though I felt that I was still at a jog my next mile was still only seconds slower. On a day like this I knew that hydration was going to make a huge difference to performance so I made sure that I took fluid on board at every opportunity. We had our personal bottles every 5km and there was sponges and bottled water in the 5k in between. I made sure I drank all of my personal carb and electroltye drink and grabbed a bottle of water and took a few mouthfuls from that and poured the rest over my head, neck, wrists and thighs, the key trigger points for cooling. I settled into a nice little pack containing fellow Brit Sonia Samuels and we all worked well together. There had been no conversation between us about working together but we are pretty evenly matched over the marathon so it naturally fell that we ended up in the same group. 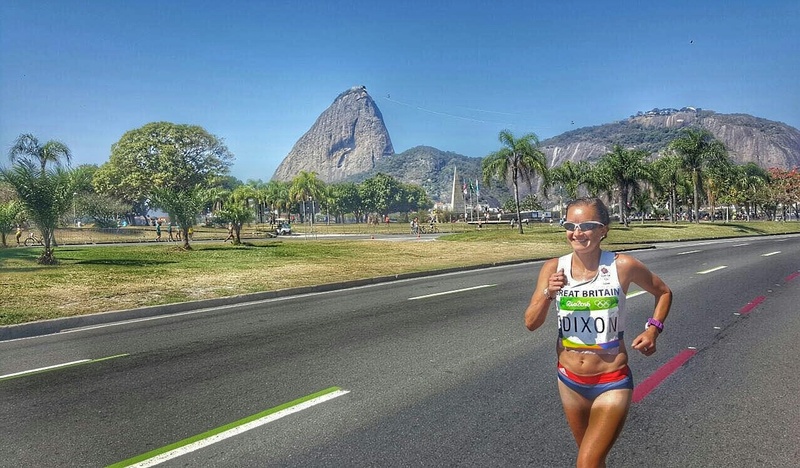 When we hit the loop part of the course I remember looking up and seeing Sugarloaf Mountain looming over up and thinking to myself “that would make a great Instagram!” Thankfully my teammate Lennie Waite clearly thought the same and managed to get a snap of me running with it in the background. 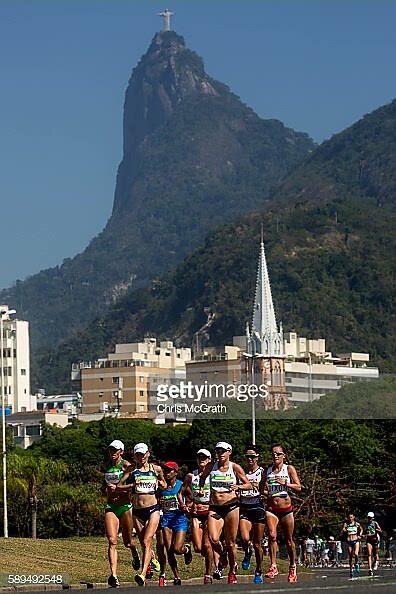 There is also a few awesome shots with Christ the Redeemer photobombing us! As you can tell by the above, I was feeling very relaxed at this point. In fact I was pretty relaxed the full way. The crowd support was amazing with loads of Union Jacks being waved and people from all over the world supporting us with shouts. I managed to pick my parents and club mate out of the crowd and give them a wave each time I went by. Sonia’s husband Nick managed to run nearly every step of that 30k section of the course alongside us and whilst he was there supporting Sonia and not me, his presence alongside us really spurred me on. Just before 30km I sensed that the others in the group were starting to fade a bit and the pace was dropping. I was quite aware that with 12km to go any extra effort at this point could come back and bite me on the bum in the closing stages so I just kept the effort levels and pace the same and this opened up a small gap between me and the other girls. It meant I ran the rest of the race by myself but I was feeling really good and strong so I was ok with that. Girls ahead had been coming back to us from as early on as 10k so I used those to help keep focus once we left the crowded part and entered quieter parts of the course. Although I slowed very slightly over the last 10k I kept the effort strong right through to 40km when I lost about 20 seconds looking for my drink bottle. This station wasn’t manned by our team staff and I didn’t spot my bottle. Each water station was a good 80metres long to fit in tables for every country participating. On the previous stations we’d had one of our team staff manning the table and waving to us to identify where they were. With there being no-one at this station I had to slow down quite a bit to try and spot our table and my bottle. I totally failed on this and missed my bottle completely. From a nutrition viewpoint it wasn’t a big deal that I missed the bottle as I didn’t need any extra energy at that point, I was still feeling good. But with the heat increasing all the time I needed something to wet my mouth. Luckily I managed to get back into rhythm quickly, grabbed a sponge a little further on and finished strong. On the long road up to the finish stadium there was a few protests going on. At about 25 miles a woman managed to get onto the course just ahead of me and although she wasn’t impeding the race security weren’t happy for her to be there so 4 guys kindly carted her off! A little further up as I turned the final corner into the Sambodromo stadium for the long run in another protester stuck a placard out which hit me in the face! Luckily It didn’t cause any damage and I was still strong enough to swerve enough without hitting it too badly but it certainly wasn’t the best thing to happen with half a mile to go in a marathon. However, now that I can sit back and reflect a bit more I think I could have probably pushed on a little bit more in the first half. 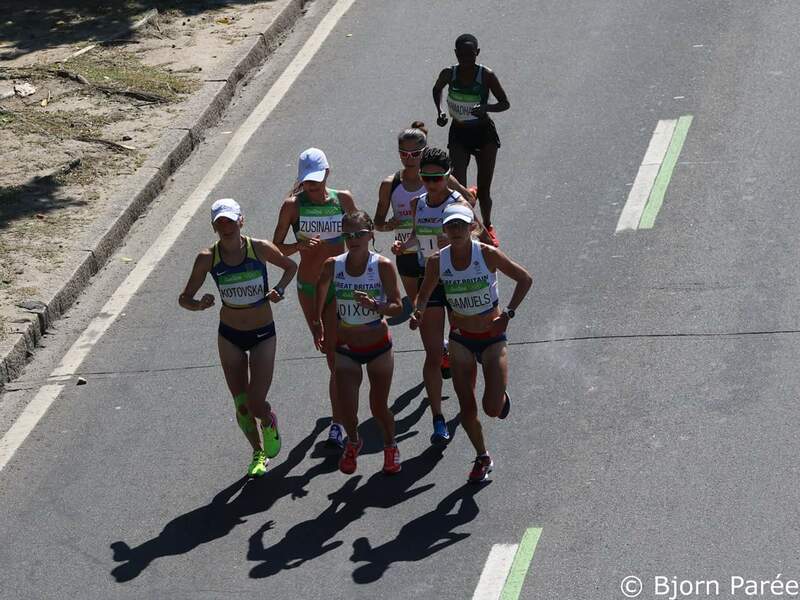 I was feeling very relaxed and strong but was worried about what the heat would do to me in the final 10k. I’m not used to running in temperatures like that so it was an unknown as to how I would cope. Yes, I spent nearly 2 weeks prior to my race in Brazil to acclimatise but my training at this point wasn’t long or of a high intensity to be able to judge how I would react so caution was the best approach. The other thing that is really annoying me is losing the time at the 40k feed station looking for my bottle. I didn’t need this bottle and the time which I lost looking for it meant that the couple of girls just in front of me, who I’don’t spent time closing in on, got a little further away again. Had they still been in catching distance I would have pushed harder right to the line instead of stepping off the gas in the last mile. Top 20 was out of reach but top 25 could have been possible. But of course, hindsight is a wonderful thing!